Leizhan headbox is applied to high-tech components and various dimensions to match various manufacturing demands for high-grade tissue paper. So as now, Leizhan headbox performance has reached to a new level owing to the carefully research and design by Leizhan experienced engineers and experts. Leizhan headbox is consisted of distribution system, rectifier device, nozzle device, flow chamber and support, air supply system. After being cleaned, screened and deinked, the fine pulp is pumped into the headbox of the tissue paper equipment for paper making. Leizhan Air supply system used of headbox ensures high efficiency of paper making process. The headbox manages the web’s profiles, and contributes to create paper properties such as forming section. The headbox distribute paper pulp evenly across the forming part. More importantly, the Leizhan headboxes are easy to operate and remain clean during operation. 1. It is demanded that the feed stock pressure is smooth; the approach consistency is stable in good quality. The inner wall of the stock tube is polished. 2. It is required that the quality of the forming wire is good with even wash and tidy. The dewatered elements in forming wire shall be flat. 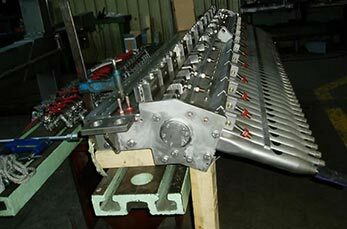 The forming board can be adjusted forward or backward precisely. 3. The user should operate the headbox according to the operation manual and clean it regularly to guarantee the headbox smooth and clean. 4. To determine the correct maintenance actions and to reach the optimum headbox performance, it is necessary to know the exact condition of the headbox.